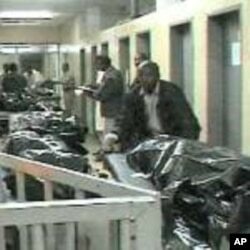 Next week, Ethiopia holds its fourth national polls since the Ethiopian People’s Revolutionary Democratic Front (EPRDF) overthrew the 17-year-old Marxist government of Mengistu Hailemariam in May, 1991. Nationwide, 43,000 stations will be open to handle an estimated 31 million registered voters. Facing the ruling party, with 501 candidates, are several opposition groups including a coalition of eight parties called Medrek, or Ethiopian Federal Democratic Unity Forum, which is fielding 421 candidates. Also running are the Ethiopia Democratic Party with 230 candidates and the All Ethiopia Unity Party, with 319. Few observers predict the May 23rd vote will be as exciting or unpredictable as those held five years ago. The 2005 elections generated great expectations. Voters seemed galvanized, and hopes were high that the polls could well move Ethiopia from largely single-party rule to a more competitive multi-party democracy. Foreign observers described the campaign season as calm and orderly, culminating in two massive rallies in Addis Ababa. One was by the ruling EPRDF, and the other featured two opposition groups: the Coalition for Unity and Democracy (CUD) and the Union of Ethiopian Democratic Forces (UEDF). Hewan Abrha was a student visiting Ethiopia at the time. She attended one of the opposition rallies, which she called history-in-the-making: "I remember a guy who ....was holding up the jar and reading poetry about the [captured] bee [inside]. [It was] really well composed, funny, political, and yet civil,” Abrha said. One observer team with the Carter Center noted, for example, that the ruling party compared the opposition to Rwanda’s interahamwe militia that had killed hundreds of thousands of opponents in that country’s 1994 genocide and civil war. On the other hand, government critics called the ruling party a tool of its Tigrayan leaders. 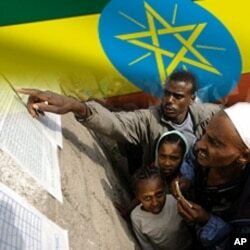 Yet, voting in Ethiopia on May 15, 2005 was peaceful, with an estimated 20 million people casting ballots. Early results were surprising – showing the opposition with a big lead. In the previous parliament, ruling party opponents had only 12 seats. Now they were poised to win over 180. The opposition was also reported to have won almost all the seats on the Addis Ababa city council. But EPRDF had its own figures – showing it had won more than 317 seats out of 547. Tamerat Giorgis, the editor of a news magazine in Addis Ababa, Ethiopia was covering the elections at the time. 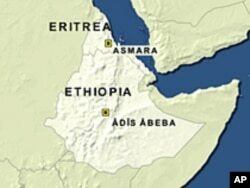 “On the evening of the polling date, the prime minister (Meles Zenawi) declared his party had lost the capital city, [though] his party had won a majority to form a government [due to his party’s win] in the four main regions. The opposition was unhappy, because they claimed the prime minister or the incumbent party preempted the result," Giorgis explains. According to Giorgis, it is the] national electoral board [that] puts out provisional results until such time that they put out the final, formal official results, which happened to be a month from the polling date. "It was unusual for the prime minister to come out [the evening of the ballot] to claim his party had won; he also banned public demonstrations for a month and announced [to whom] the security forces in Addis Ababa were directly accountable to,” Giorgis says. The Coalition for Unity and Democracy (CUD), which according to the election board won 20% of the vote, cried foul. In an interview with VOA at the time, information minister Bereket Simon recognized that the ruling party had lost in many of the urban areas. “The opposition has improved their seats, and made significant strides. Nevertheless, we know they don’t have previously established infrastructure in every [region]. Their organizational network is not as good as the ruling party’s. The efficiency of the [EPRDF] gives us the advantage [over the opposition],” Simon declared. He also said the opposition was trying to discredit what the government considered an open and transparent electoral process. “While they have won in some areas like Addis, and we have accepted our defeat, they were telling people that Addis had been cheated. But when they started to [realize] they had a landslide victory there, they recoiled, and began withdrawing their claims,” Simon declared. In June, government security forces opened fire on opposition supporters protesting the alleged vote rigging. A public inquiry into the violence determined that 200 were killed, including six policemen, and over 700 injured. Tens of thousands of opposition leaders and supporters were jailed. 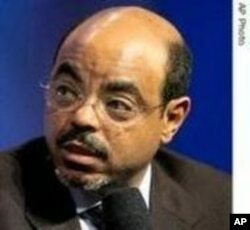 Prime Minister Meles Zenawi defended the crackdown by accusing the detained of trying to overthrow the duly constituted government of Ethiopia. In other words, treason. 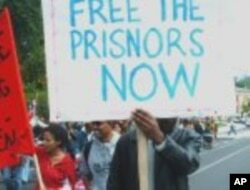 In a 2005 interview with VOA, Professor Alem Ante Gebreselassie, an Associate Professor of Law at the College of William and Mary in Williamsburg, Virginia, discounted the accusation. He said the government was focusing on parts of the constitution that serve its interests, while ignoring other sections -- like the one guaranteeing respect for human life. “The constitution that the Meles regime is very sanctimonious about," according to Professor Gebreselassie, "provides that every person has a right to life. No one can be deprived of [that right] except as punishment for a serious criminal offense as determined by law. Yet, more than 100 peaceful demonstrators have lost their lives since the flawed May elections. In other words, the government wants to have it both ways.". It took nearly three months to reach the final count. Almost 300 official complaints of vote rigging and other irregularities were lodged. Only 31 cases were found worthy of a re-vote. The ruling party won all of these, due to the lack of participation by the opposition. On September 5th, the National Electoral Board of Ethiopia, whose members were appointed by the EPRDF, released the final results. It said the ruling party retained its control of the government with 327 seats, nearly 60% of the vote. The combined opposition, according to the official figures, won a total of 174 seats, or 32% of the vote. Many CUD and other opposition members initially boycotted parliament, though the U.S. State Department notes that by March 2008, about 150 had taken their seats. The increased opposition presence had little influence on policy making. Under old parliamentary rules, 20% of the legislature could propose agenda topics; for the new parliament, 51% was needed. The federal government assumed responsibilities that were once the domain of the Addis Ababa city government, including issuing permits to public rallies. Many foreign observers supported the initial openness of the campaigns and access to the media, though they noted problems with the counting. The Carter Center said the polls demonstrated significant advances in the country’s democratization that could bring what it called “a historic sea change” in attitudes toward political power and competition in Ethiopia. A group representing donors said the polls confirmed the EPRDF’s majority in Parliament, and it looked forward to “a dynamic parliament in which the opposition has a strong voice.” The US State Department called the polls a milestone in creating a new multi-party system, and pledged to work with the government and international community to strengthen the electoral process. The European Union observer team was more critical. It cited the support of state institutions for the EPRDF campaign, and irregularities in the counting of ballots and in the publication of the results. Its final report also questioned the ability of the Supreme Court to be an effective appeal mechanism to the decisions of the National Electoral Board, since both institutions were headed by the same person. “We have a ruling class which is very smart in using politically correct rhetoric pretending that they want democracy, but judging from the actions that are documented in the report, that is not happening,” said the head of the EU mission, Ana Gomes, explaining her view to VOA in 2005. Today, Ethiopia’s fractured opposition says voters still want change. The former vice chairman of the CUD, Professor Berhanu Nega, recently told VOA the EPRDF never thought Ethiopians would come out in such large numbers on the basis of ideas for liberty and democracy. "When given a fair and transparent opportunity," he says, "they’d vote for change."